I would never say I am a technophobe. I have a fair number of gadgets. A Sony reader, a Kindle, a BlackBerry, a Samsung Galaxy tablet a Kindle Fire HD and a laptop computer. Not bad for a girl who didn’t really touch a computer until she was in her mid twenties, (apart from playing Chuckie Egg on my sisters Dragon 32). You will notice not a single Apple product among them. I really don’t understand the mass hysteria over the release of each new gadget from that company and so find myself determined not to be a sheep and follow the flock to the nearest Apple store (I actually have no idea where the nearest one is). Although I have all this stuff, my girls really don’t touch it. At four and nearly six I thought them too young for expensive technical items. I was chatting to a friend of mine, who felt the same way I did, but she told me her husband disagreed. He said kids have so much technology around them, that it’s not a big thing for them like it is for us. It was a really good point. I started watching the girls whenever we went into an electrical department or store and was totally amazed by how easy they found using the display tablets, even Bart at four years old was swiping screens and touching pads. So, for their birthday’s and Christmas their Nana and Great Granddad (my grandparents) sent them some money. 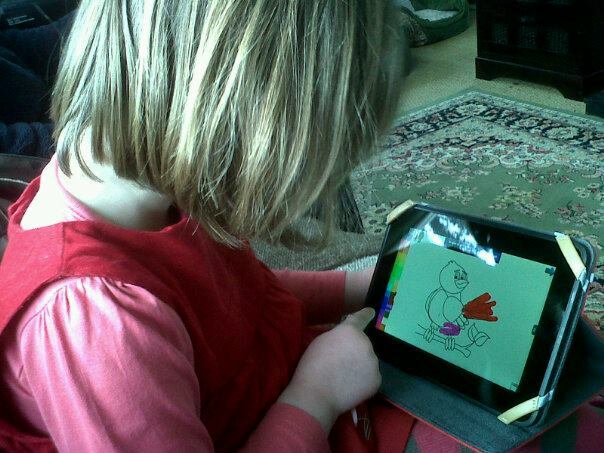 With Jay and I adding some towards it, both girls bought a Kindle Fire HD. I loaded some books and games on each one and let the girls have them. I kid you not, my girls spent over four hours today, sat on the same sofa in the living room and I didn’t hear a single raised voice, argument, ouch or Muuuuuuummmmm …. I admit, I will be limiting their time with the Kindles as I don’t want children who never lift their heads from the screen, but oh what a peaceful day. We bought Mea a Kindle Fire last year for her birthday. She loves it. Lots of games, books, not to leave out movies and TV shows that she likes to watch. I went ahead and became a “prime” member with Amazon, and that makes things even better, free 2-day shipping on everything! Do you guys have Netflix over there? I was able to add Netflix to Mea’s KF, and she watches movies on that frequently when we are in the car and such.